Five by Five executive creative director Craig Bailey and senior producer Jeff Edwards (featured image) are taking some time out to give back. 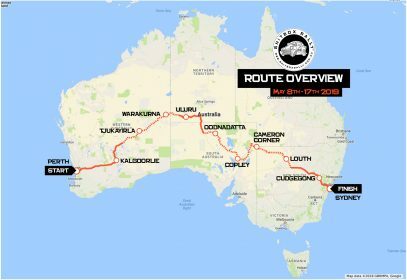 Participating in the 10 year anniversary of Shitbox Rally from 8-17th May Bailey and Edwards will navigate 5,150kms of mostly dirt road from Perth to Sydney via Uluru in a car worth less than $1,000. Whilst it’ll be a tough and wild ride, it’s all being done for a great cause. The Shitbox Rally is the largest community lead fundraiser for the Cancer Council in Australia, raising much needed funds for vital research projects and support services for those affected by cancer. To date, the rally has raised over $18 million. Old School Raver #1 Craig Bailey said: “Many of us are affected by cancer one way or another and it’s no different for me. “My father has battled prostate cancer for 10 years and without some of this research, he may not still be here today. The rules state cars can be worth no more than $1,000 and 2WD only so the boys believe they have found the perfect old banger for the job – a 1989 Volvo 240GL. With almost half a million clicks on the clock surely it’ll manage another 5,000? Volvos are, after all, ‘Boxy but good’. Over the last few months, their car has been transformed: repaired, painted, baked, striped, and of course, decked out with nose bleed base and a light show the best of Gatecrasher would have offered in its pomp. The Old School Ravers are sponsored by industry partners Five by Five, //Thirteen & Co and Storage King Eastgardens. Such support and generosity is a big reason their current donation efforts have reached almost $12,000.